‘My belly thinks my throat’s cut,’ your man gasped. His face was red and he was breathing in short sharp gulps, sucking in the air like his life depended on it, which of course it did but usually without the dramatics of this particular moment. We were on the Mountain Loney, towards the top, at the very steep turn on the road. The two of us stopped to take in the view behind us and to catch our breath. ‘Indeed and I do’ I said ‘ it was a wee Protestant church’. 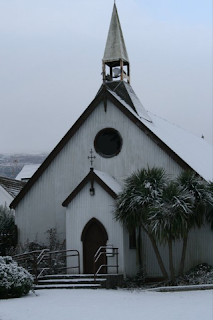 St.Mathais Church on a winters days. He was breathing more evenly now. ‘I never tuk any breakfast’ he mused. ‘I’m famished now’. ‘You shud always have breakfast’ I chided him. He ignored me and whistled to Snowie. Snowie ignored him. That gave me some satisfaction. ‘Do you remember the flax ponds over there’ he asked, pointing down to the back of New Barnsley where three ponies were grazing. ‘There were two dams and an old mill’ I said. ‘Joe Magee slipped in one day and we rescued him’ your man recalled. ‘We were always rescuing Joe’. ‘Let’s go on’ he suggested. The black railings of the reservoir loomed beside us as we reached the top of the Loney. ‘We can’t get through here’ your man observed. ‘unless we cut into the field here’. ‘Do you remember there used to be a fresh mountain stream over there?’ your man reflected. ‘A mountain spring’ I recollected ‘ we called it the waterfall’. ‘Things always luk big when you’re wee.’ He said. We struggled up from the field on to the mountain path and paused before setting off on the upper one. ‘We used to call this the forest but sure it’s only a wee small stand of trees’. ‘And the cave? We cudn’t fit into it now’. Snowie darted ahead of us. ‘Yeah he cried his eyes out that day. Your Paddy cried a lot in them days’. ‘Not as much as Joe Magee’ I reminded him. ‘This path used to be wide enough for a horse and a cart’ your man paused again. We looked backwards over Belfast. The Lough stretched beyond the cityscape towards the distant but clearly visible hills of Scotland. To our right the waters of Strangford glistened and further to the south east the Mournes slipped down to the sea. ‘There’s our house’ your man pointed down to the Murph. ‘There’s a hurling match on at Saint Galls’ I said. ‘I suppose you can see who is winning’ he griped ‘Let’s stop at the Hatchet Field. He looked pained. I was perspiring freely but your man’s face was beetroot red and he was breathing heavily again. ‘When ‘s the last time you came up here?’ he gasped. ‘Last month during the snow’ I replied. ‘ This is the hardest bit. From the Hatchet Field to the Gully is easy peasy. We flopped down beneath the big sycamores on the edge of the Hatchet Field. ‘The hare must have been sleeping and we came up wind of it. It tuk off like a lilty and us all charging after it guldering like eejits. That was just over there. Our Rory nivver came back for hours’. Your man’s face softened at the memory. The two of us were wee boys again. ‘Rory was a great dog’ he recalled. I paid him no heed. We sat together in contemplative silence. Snowie stretched out beside me. I scratched him behind the ears. Your man didn’t know what he was talking about. And that hare didn’t know how lucky he was. If Joe Magee hadn’t tripped over our Rory that wee dog would have caught the hare as easy as anything. There was no doubt about that. Though looking back I didn’t want the hare to be caught. The chase was good enough. 'I’m glad the winters over’ your man smiled. ‘and I’m glad we came up here’. Ireland will achieve grand dreams, a day at a time, so set goals for each day, not long and difficult projects, but chores that will take you, step by step, toward your rainbow. The Irish finance minister says the country has been left with "an appalling legacy of debt, unemployment and low morale". As Ralph Waldo Emerson said "The mass of men worry themselves into nameless graves while here and there a great unselfish soul forgets himself into immortality." To make something better does not interfere with creativity. It in itself becomes a creative act. This is a time for great creative Purpose,for Purpose is what gives life a meaning.